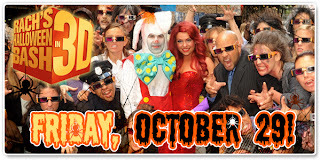 Rachael Ray's talk show will be in 3D for Halloween on Friday. You can get 3D glasses for the big event from the October 25 issue of TV Guide. Pee Wee Herman and Penn and Teller will perform special 3D bits for the show. Should be interesting, huh?